In their bid to strengthen security and realise the economy in the Maritime space, stakeholders yesterday concluded a two-day meeting to develop a national maritime strategy for Sierra Leone. The workshop which was organised at the Maritime Administrative building, Government Wharf in Freetown, attracted personalities from the Strategy Policy Unit (SPU) at State House, Ministry of Fisheries and Marine Resources (MFMR), United Nations Development Programme (UNDP), the United States Embassy and the Office of the National Security, among others. Whilst officially opening the workshop earlier, Deputy Minister of Transport and Aviation, Alhaji M.A. Jalloh, said the country has a vast maritime domain, which, if tapped into, will provide the country with additional resources. He said considerable attention has to be directed towards security in the country’s maritime sector, if they could realise its resources. “Development in the maritime sector is an essential foundation for stability and sustainable peace on the Africa continent. This process of development is all but impossible to achieve in the absence of security on land and offshore,” he said. He said during the workshop, stakeholders would examine the existing state of affairs, provide a vision for what a future should look like and devise a plan of action on how to get from the present to the future. He said the National Maritime Strategy would address the challenges and help seize the maritime opportunities that the country had lost over the years. He commended the United States government and UNDP for hiring an expert consultant to work with maritime administration and other stakeholders in the sector. 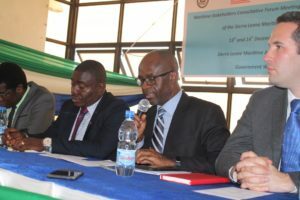 The Deputy Executive Director of Sierra Leone Maritime Administration ( SLMA), Alphious Cole, said the idea to develop the strategy was a step in the fulfillment and implementation of the binding recommendations in the Yaounde’ code of conduct concerning the repression of piracy, armed robbery against ships and illicit maritime activities of which Sierra Leone is a signatory. He noted that the strategy developed would meet the increasingly and rapidly changing use of the waters. Earlier in his opening remarks, Chairman of the occasion, Simon O.D. Johnson, who also doubles as the SLMA’s Head of Research and Project Unit, said the consultative meeting was timely as the country was taking steps to diversify its economy after suffering from the twin shocks. “The drop in the price of mineral commodity has proved to the government that it can’t depend on the extractive industry alone. The total economic benefits of areas like the blue economy are yet to be fully assessed,” he said. On his part, the consultant, Dr. Ian Ralby, said he was in the country to work with the SLMA to develop the strategy because its sea economy remains largely unassessed. He noted that the country was losing a huge economy on the sea as over 90% of the word’s trade was done on sea.